The appointment of two young Dominican athletes by the International Olympic Committee is a sign that the Dominica Olympic Committee’s (DOC) international reputation is on the mend. Brendon Williams was appointed as Regional Representative to the recently concluded Commonwealth Games Advisory Commission, while Sharome Burton was chosen as a Representative of the PANAM Sports for the International Olympic Committee Young Reporters program which will be run during the Youth Olympic Games in Argentina in October. 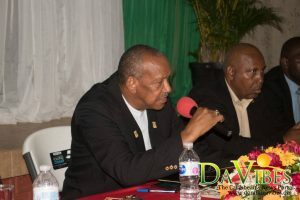 This comes one year after a new executive, led by retired elite umpire Billy Doctrove, was elected to run the affairs of the Dominica Olympic Committee. Doctrove noted that the DOC’s reputation was severely damaged by the committee’s previous executive, and upon being elected, the new executive worked to address that issue. “We have had to pay much attention to the image of the DOC, both on the local and international front. And two appointments confirmed, quite clearly, that internationally, the DOC is once again regarded as a trustworthy organization,” he noted. Doctrove further noted that under the previous administration, and with the DOC’s image, there was little chance that the two nominations would have been considered or even accepted. He added that acceptance of the DOC’s nominations for the respective positions, is a clear indication of the progress that the DOC has made under its new management and “testimony to our newly found status”. “We are indeed proud of this two young men and we were always fairly confident of the quality of our nominations submitted would have been successful. The new found confidence in the DOC is now apparent and plain to see,” Doctrove added.